Josh, 2009, originally uploaded by chrisfreeland2002. We adopted Josh from the St. Louis City Pound in the fall of 2000. The Pound was a bleak place, a kill shelter, which is why we decided to adopt from there. He was in a crate with his litter mates, all cute fuzzballs from their German Shepherd/Chow mix. I initially picked up one of the tan females, but Chris noticed a little guy who had woken up, all black with tan spots on his eyes and legs. That was it, he was ours. We got him because our other dog, Samantha, was part Corgi and she really needed something to herd besides us. She loved having a puppy and kept him in line. 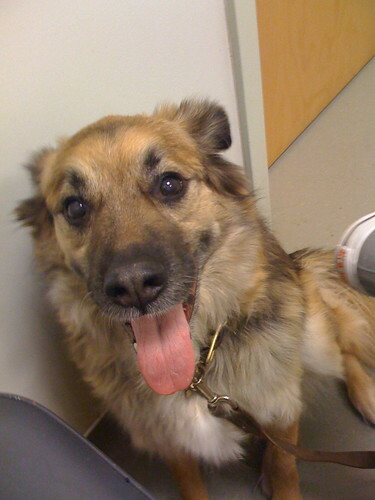 Right from the start he was always just a happy dog…he didn't think he was a person trapped in a dog's body, like Sam, he was just a dog with a big goofy grin & a pretty tail (we called him "Fluffy Britches" because of how the fur on his haunches looked like fuzzy pants). Actually, I was afraid he was a little mentally challenged because one summer when I was painting our dining room I looked over and he was drinking paint out of the tray. His nose & all the fur around his mouth were buttercream yellow. It was actually pretty funny, and after a little wretching session outside he was fine. He loved to fetch his toys, especially tennis balls when he was younger. We'd throw them from our front room into our kitchen (yep, throwing balls & dogs running in the house, all fine with us) and he'd scramble to go get it. After a couple of tosses he'd take his ball & go lay in the corner, a not-too-subtle notice that play time was over. In December 2008 Sam was diagnosed with cancer. She had surgery to remove the tumor from her colon and while she was having surgery, Josh started getting sick. We took him to the vet and he was diagnosed as diabetic. We had no idea how we were going to care for a diabetic dog. We had both started traveling between 25-50% of our time for work and it just didn't seem possible that we could manage twice daily insulin shots to keep him well. We decided, since neither one of us was traveling the rest of December, to just see how it went and decide next steps in 2009. He responded well to the insulin and we figured out how to make it all work, mostly due to having a fantastic neighbor/friend/dog sitter, Jamie, who could give him shots when we traveled. Amazingly, we gave him more than 1,700 shots and never missed a single one. Not one. Sometimes we couldn't give him his shot if he hadn't eaten, because the insulin had to be given with food to be effective, but we were there to try. He slowly went blind due to the diabetes. We never gave him much credit in the brains department (see the paint incident above), but he had total mastery of our house, yard, and neighborhood while almost completely blind. I was impressed at how a blind dog could get around on his own - he knew where all the furniture was, where the steps were, and would even feel his way around with a front paw if he wasn't entirely sure he was at the steps to our deck. He decided on his own one evening that he was no longer going to go up our steep stairs to the second floor, so he quite happily continued on as a first floor dog. When we'd go upstairs he took it as his opportunity to get up on the couch. This year his health started to decline. His blood sugar was less evenly regulated, and he started to slow down. We knew we were getting close to the end, and that he would let us know when it was time. That day was today. I was at home this morning, luckily, for an inspection of our apartment building next door. After the inspection I came over to let the dogs out before going in to work. I was gathering my stuff when I heard our other dogs barking in a sharp, alarmed way, and I went outside to find Josh on his side having a seizure. He had had a bad episode about 2 months ago while we were out of town, and had spent a couple of days in the hospital, but had rebounded back. I should mention that these were not hypoglycemic incidents (the "Shelby, drink your juice!" Steel Magnolia kinds of things that all diabetics go through) but full-on seizures. I knew today was different - I could just tell. I put the other dogs away and took him to our vet. After careful consideration with our vet, the absolutely wonderful folks at Kingsbury Animal Hospital, and after a call with Chris, who was traveling, we made the decision to end his suffering. He went peacefully and without pain, just after 1pm today. It's always sad when you lose a pet, even (especially?) when you know it's coming. I didn't expect it would be today, but I also wasn't unprepared for it. I take comfort in knowing we did an amazing job keeping him happy and healthy in the 3 1/2 years he was diabetic, and that we were able to help him reach an advanced age in spite of his ailments. He gave us nothing but love, and we did the same for him. I'm going to miss him like crazy. And as our neighbor Sharon said, thunderstorms will never be the same.